Over the years I read and studied pretty much every system available for organizing my digital media collection. However, because the systems I found were mainly targeted to professional photographers I realized they are too complex and I ended up creating my own system. I also answered criticism and sometimes I had to adjust my own system in response to good comments. During this quest for a simple and efficient system for organizing my digital photos, I kept asking myself one question: How do I know if my system is a good system? Read on to find out a few simple ways you can use to test your own system and see if it measures up to what it is supposed to be. Are you overwhelmed by your digital photo collection? It is pretty simple to know when you are overwhelmed by mess…any kind of mess…you just feel it. When you have a messy house you just feel you have to clean it. And with a house it’s easy…just put everything back. Simple! However, what would happen if you do not know where everything belongs? What if you did not know how to put everything back? You would feel trapped! What about your messy collection of digital photos and video? It is messy and you know you should get everything organized. But do you know how to clean it up? What if you want to clean and organize your digital photos but you don’t know how? That would make you feel overwhelmed and very frustrated. I know that feeling, so let me share a bit of my own story. Sometime before I got serious about organizing my digital photos I used to be overwhelmed by how many digital pictures I had on my computer. In addition my sense of being overwhelmed was getting worse once I started keeping track of just how many new digital photos I was taking. This sense of helplessness reached the bottom when my first child was born some years ago. My daughter’s first year generated so many digital pictures and videos that I was completely swamped. I simply could not keep up with myself. I realized finally, that in order for me to be able to enjoy my digital photos I must learn how to keep a “clean” house on my computer. I was determined to come up with a simple and efficient system for organizing my growing collection of digital photos. That’s how OrganizePicture.com and the acronym STORE (Shoot, Transfer, Organize, Retrieve and Export) were born. Enough of my own history. However, soon after I started making some progress and my growing media collection was getting under control, a question started nagging me. I couldn’t get it out of my head. Was my system for organizing my digital photos a good system? Or was I just busy moving folders around and trying different software? 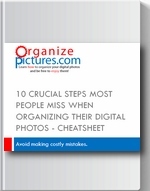 How do you know if you have a good system for organizing your digital photos? Over the years I have developed a few simple questions that I keep asking myself as I use my own system. These questions help me measure the effectiveness of my STORE organization system. Do I know exactly what to do when I transfer new photos from my camera or phone? Or do I panic and not know what to do? In other words, is the entire process repeatable? Do I have a way to allow myself to be messy for a short while? In other words, does my system contain my short term mess in one place when I do not have time to perform all the steps in the system? Is it easy to pick up where I left off? Can I easily find the photos I need? Or do I keep guessing where they might be? I can obviously answer yes to all these questions after many years of testing and refining my STORE system. How about your system? How good is it? Are you ready to put it to the test? Here is the simplest test for you to apply to your current system for organizing your digital photos. The first and simplest test for your digital photos organization system is to think about how you feel when you get new pictures transferred from your camera (or phone) to your computer. Do you know what to do? Do you know where those new photos belong? If you’re not scared, you’re not overwhelmed, you just transfer them to your computer and you know exactly where they should go in order to find them later….then you are an organized photographer. You’ve done it many times before the same way and you can do it again. You’re in control. If on the other hand, new digital pictures just make you feel more overwhelmed and more out of control, then…well…you need an efficient system like mine.